Choosing a raw food diet with a variety of different meats gives your pet a natural, healthy, diet — the way nature intended. Frozen raw food is the freshest and is the easiest to digest. The finely ground bones in whole animal raw food provides a great source of calcium and phosphorous. Whole animal food includes meat, bones, vital organs, heart, liver, lungs, kidneys and tripe - all the ingredients for full nutrition. With every advantage of a natural diet, longevity is increased and energy abounds. Pets have the nutrition they need to develop healthier muscles and lean strong bodies. 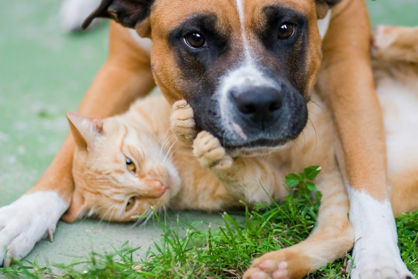 Pets build resistance to disease and allergies. Fleas, ticks and worms are rare, as are skin, ear, teeth and eye problems. Arthritis is reduced. Stool volume decreases as raw food is easily digested. Dog odour is a thing of the past. Besides being rewarded with a healthy, happy pet, you should, over its life span, enjoy the financial benefits of fewer veterinary bills. To maintain a balanced diet, you need to feed a variety of different meats. Raw feeding whole animal food, without question, provides a truly natural diet, the way nature intended. All food is free of additives and preservatives.